Three children walked away from the cottages on the edge of town toward Berwick Waters. Later that day, only two of them came back. Alice Tully knows exactly what happened that spring day six years ago, though it’s still hard for her to believe it. She’ll never be able to forget, even though she’s trying to lead a normal life, she has a job, friends, and a boyfriend whom she adores. But Alice’s past is dangerous, and violent, and sad... And it’s about to rip her new life apart. A gripping and emotionally searing novel by accomplished British author Anne Cassidy, Looking for JJ infuses a terrifying subject with humanity and hope. Jennifer Jones is wanted by the world media. At only ten years of age, she was changed with murdering another child and sentenced to six years for manslaughter. When asked about her childhood by a psychologist, Jennifer couldn't describe her childhood as being abusive, she simply wasn't important enough to warrant any attention. Being incarcerated wasn't enough for the blood thirsty media, who would sensationalise headlines to fuel hatred towards the ten year old. But where did Jennifer's life go wrong? With no father, it had always been Jennifer and her mother, a glamorous model who was slowly approaching the end of her career. But as opportunities began to dwindle, her mother would go above and beyond to maintain her modelling status. First it begun with leaving Jennifer with her mother, who reluctantly cared for her grand daughter for months on end. She was left with strangers who barely spoke to her, until she was six. At six years old, her mother often left her to fend for herself. Leaving for hours on end with the television and a simple doll, her only friend, for company. It wasn't until Jennifer moved to Water Lane with her mother, that she was able to experience a home of her own, a new school and friends. But behind closed doors, her mother began to deteriorate, taking any paying modelling position she could find. It isn't until years later when Jennifer realised what her childhood had become, lies, neglect and pure anger towards anyone who didn't idolise her mother as much as she did. Alice Tully has never truly forgotten what happened that day. Three children set off towards the lake, but only two returned. As the media report on Jennifer Jones being released back into the community, the memories that haunt Alice, may just destroy her life. 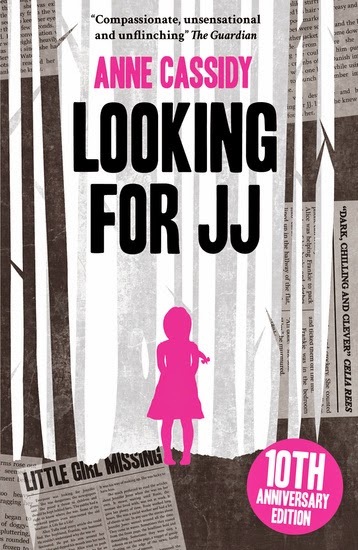 I hadn't heard of Looking For JJ previously, but boy, this isn't one I'm likely to forget. The Notebook Sisters reviewed this one a few weeks ago, and the incredibly cryptic review had me excited to start reading, it's not often you come across so many vague reviews, but once you've discovered Jennifer Jones, you'll understand why. This book left me an emotional mess, it was distressing to say the least. Looking through Jennifer's memories of her childhood was traumatic, she may not have been physically abused, but what Jennifer had to endure was equally, if not more heartbreaking. Anne Cassidy created a storyline that blurred the lines of what was reported as a criminal case, but provides Jennifer's story of how a child can commit what is seen as such a heinous crime. With the subject matter being so delicate, it was told in an innocent and childlike manner which you can't help but feel for Jennifer's character. I believe that her crime was a result of her environment, but still can't be excused. I don't think I've struggled with a review as much as I have with this book, it left me tired, emotional, conflicted and with a new perspective on how children are a product of their environment. I received this for review the other day and I'm really excited to read this, even more so now. I'm so curious about it all. Like I wanna know if Alice is Jennifer or what? Love the cover. Hopefully I'll be reading this next. Glad you enjoyed it, great review! It's truly gutwrenching Sunny, but it'll capture your attention and you'll find it hard to put down. I can't believe I hadn't heard of it before, hopefully current bloggers can pick up a copy, this book deserves the recognition. I had no idea it was that good either Laura. It sounded interesting, but it far exceeded my expectations. Can't wait to see what you think of it. I kept thinking, now I know why her review was so vague. It's impossible to review properly without giving anything away, think that adds to the lure of this one as well. I'm going to chase up a copy of book two, or the curiosity will get to me. I received this and wondered how it was so little known when it's been around for so long!? It sounds like a really intense read, and I was considering passing it up, but now I think I'll read it, Kel! Definitely give it a go Mands, it's one of those books that will break your heart though. I'm so glad I took a chance and read it. There's a sequel too. Oh wow, this book had you sobbing? Aww...there there. Now I have to read it, too! I want to know what made Kelly cry. And Dre might cry, too. I am so curious about what happened, have to get my hands on this! Practically Dre, what Jennifer went through as a child, it's heartbreaking. Fingers crossed you can find a copy, the original was published over ten years ago, luckily the anniversary edition was recently released. I think you'll love this one too Dre. I think Amazon might have a copy for Kindle, I'd have to check...oh, they do! Ugh. I'm not sure I want to read this now. I remember seeing Cait's review of it, but the more I research about it, the more I fear of what I will become once I turn the last page. I'm all for psychological drama stuff, but oftentimes I'd rather stay detached. When a book is too moving, too real, too disturbing, too heartfelt... it can give me nightmares. Not that it's bad, it's definitely a sign of the author's incredible writing prowess, but I feel like after reading books like this, I lose a little bit of faith in humanity as a whole as I know these stuff happen in real life, and being reminded of that is like being hit by a pick-up truck :( Sometime it's so necessary though. You're brilliant Faye, and you've summed up exactly what this book entails. It's really a dose of reality. There are a few shocking parts, but nothing that will overly distress anyone. It's really raw and confronting, but the author really treated the overall storyline with an incredible amount of care. It really is worth reading. Wow, this one I'll have to pick up soon but it sounds super emotional and intense! And very thrilling. Thanks for the warning about preparing the tissues. Oh Jeann, it's incredible intense. It was so hard to review because of so many twists in the storyline, it's one of the few books I've read that felt like you were reading a journal of personal thoughts and memories, not a widely manufactured book. This is my first time hearing about this book! It sounds very thought provoking as well as emotionally upsetting. I can totally understand why you were sobbing. Great review! I guess this is going on me TBR list now even if I hadn't heard of it before. It actually sounds like a very powerful story (seeing as you were still in tears) and I am kind of scared to read it .-.